Be the first to hear about their new releases and deals. Download the Booksprout app and search for Russell Newquist today! Russell graduated from the University of Alabama in Huntsville in 2000 with a BA in Philosophy. Naturally, he began a career as a computer programmer. Later, he went on to earn a MS in Computer Science. Somewhere along the way he earned a black belt, and then added a few stripes to it and opened his own dojo. Thinking that he didn't have enough hats to wear, he started publishing company Silver Empire and has written some stories and might write some more. 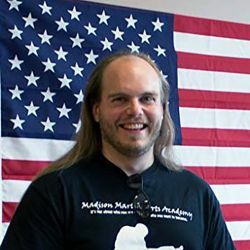 He lives in north Alabama with his wife, three kids and three dogs in a house that still manages to have more computing devices than living beings where he attends a Roman Catholic church, continues to run his dojo, and works for a small software company.